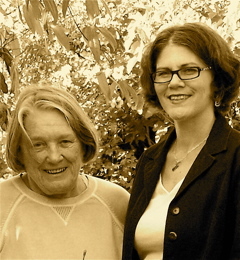 SparselySageAndTimely.com extends a warm “Happy Birthday!” to restaurateur Pat Healy of Point Reyes Station (left), who topped 80 on Wednesday. 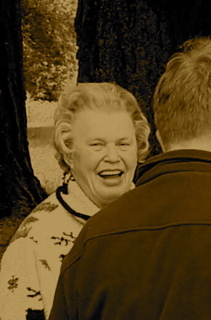 Pat operated the Station House Café for 30 years, during which time she turned the former hamburger shop into a restaurant praised in Gourmet and other food-and-drink publications. Pat in June 2005 sold the café to its manager Sheryl Cahill (right), and as of this writing, Sheryl was planning a party with no-host bar for Pat this Thursday (March 29) from 5 to 8 p.m. in the Station House. Also celebrating her 80th birthday is Missy Patterson of Point Reyes Station, who will turn 80 on Sunday. For 24 years, Missy has run the front office of The Point Reyes Light, where she is circulation manager. While the job requires dealing with all manner of people, Missy is never overwhelmed, having raised 11 children of her own, the youngest of whom, Duncan, drowned in Papermill Creek while still in his teens. 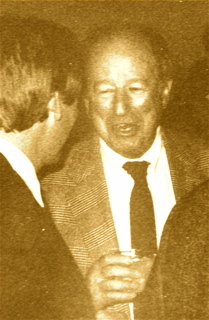 More than once Missy regaled the old Light’s staff with an account of the time her former husband, Realtor Donald “Pat” Patterson, needed to stop by the Inverness home of Professor and Mrs. Seth Benson on business. 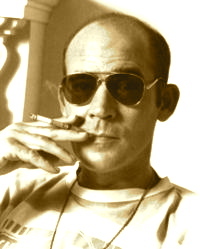 The professor taught Zoology at UC Berkeley, and he and his wife (both now deceased) were part of the Zero Population Growth movement. While the men discussed business, Mrs. Benson invited Missy to chat in the kitchen, quickly turning the conversation to ZPG. “And how many children do you have?” she asked Missy. “Eleven,”Missy answered, and Mrs. Benson began shouting at her, “Out! Out of this house!” True to form, Missy left feeling amused rather than insulted. She was my wonderful colleague for 21 years, and SparselySageAndTimely.com sends her a sincere Happy 80th Birthday wish too. Missy’s real name, by the way, is Rosalie, but nobody around here calls here that. Which gets us to the nature of nicknames. Not long ago I hired Nick Whitney of Inverness Park, one of the members of Pacific Slope tree trimming services, to cut down two Monterey pines that had died near my parking area. If the trees had fallen in a windstorm, the worst damage would probably have been to neighbor Toby Giacomini’s barbed-wire fence, but that was enough for me to want them out. 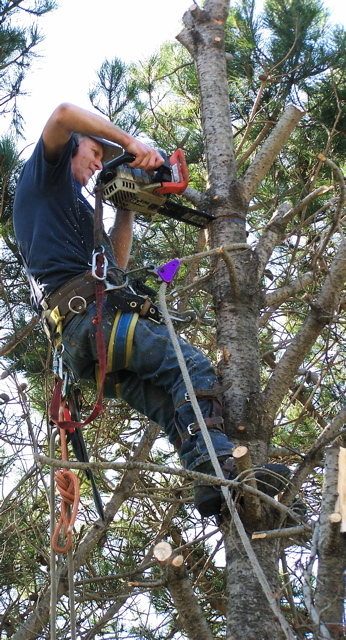 In addition, I wanted a large limb growing over my roof removed from another pine, so Nick sent over a crew consisting of Brian Arnold (seen above), Pepe Franco, and Nacho Franco. 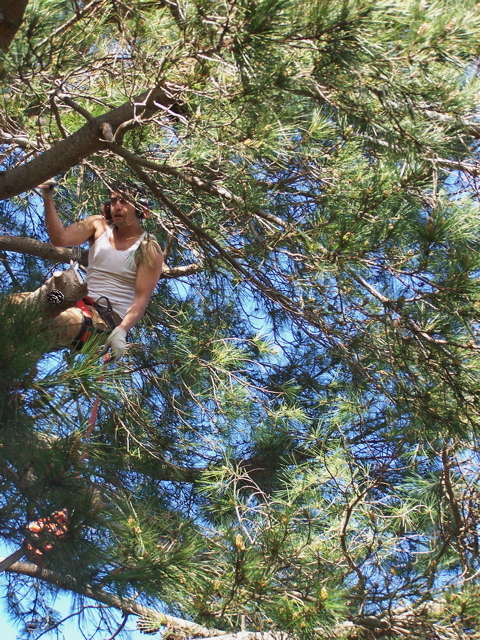 Brian and Pepe (seen above) have trimmed trees at my cabin previously, so I expected — and got — a good job from the crew. Not having to worry about their work, I found myself instead wondering about their names. I had to do a bit of research, but it turns out Brian is an Irish name meaning “high or “noble,” which should please him. After seeing Brian dangling from the top of a pine tree while avoiding large limbs falling from his chainsaw, both Gaelic meanings seemed appropriate. But how in the world did “Pepe” become the nickname for “José?” When I finally found the answer, it surprised even my Spanish-speaking friends. “José” is derived from the old Spanish equivalents to Joseph: “Josep” and “Josepe.” (In Italian, the name would be “Giuseppe.”) Because the final syllable of Josepe is stressed, it was a short step to “Pepe.” So, Joe, now we all know. Life in the wild includes a fair amount of suffering, as this raccoon with a third its tail missing bears evidence. 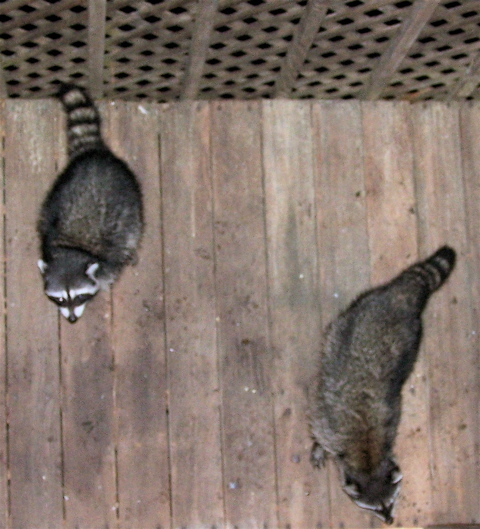 A couple of raccoons cut across my upper deck almost night every night an hour or two apart. In fact, a fair number of nocturnal creatures take shortcuts across my deck to avoid having to go around my cabin, and I’ve also spotted a roof rat, numerous possums, and from time to time a family of foxes. During the day, my deck gets an entirely different crowd of visitors — mostly birds on my upper deck, lizards and frogs on my lower deck. Not surprisingly, I’ve come to recognize which raccoon is which and tell one crow from another. So a week ago I noticed when my 8:30 p.m. raccoon failed to show up for three nights. When it finally reappeared the fourth night, the raccoon seemed more skittish than usual as it passed by. 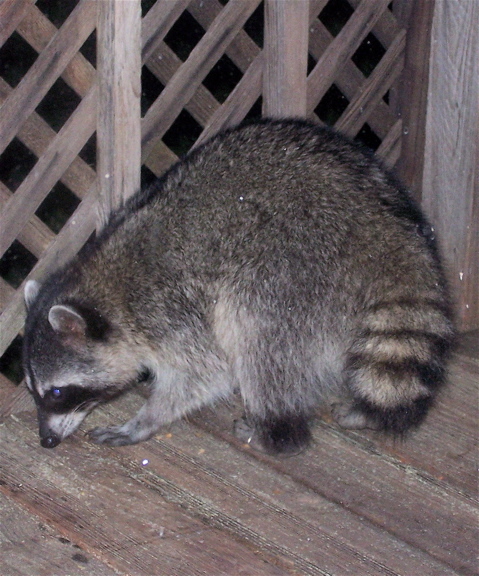 I threw several crackers on my deck, and the raccoon returned so I could give it a closer look. What I saw was grim. At first glance, it appeared to have lost its left eye; the socket was filled with mucous. 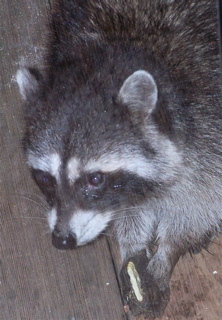 I snapped a photo of it to study the injury further, hoping to determine if the raccoon had been in a fight. From all appearances, it had not, for only tissue at the front corner of the eye was torn. There were no other injuries. I kept watching for the raccoon the next few nights, and Mac Guru Keith Mathews of Point Reyes Station happened to be visiting when it showed up the second night and by then was already starting to recover. 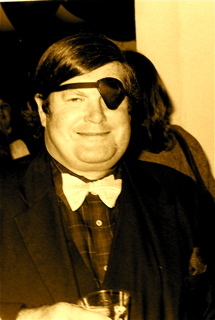 Keith’s guess was that the raccoon had poked herself in the eye — possibly while nosing around in a hole. Made sense to me although I wouldn’t rule out a fight. I’ve seen raccoons fight, and they are ferocious in battle. About the time the 8:30 p.m. raccoon’s eye seemed to be almost back to normal (at left), former Point Reyes Station innkeeper Dee Goodman, who is visiting from Mexico, noticed something odd about the 10:30 p.m. raccoon. Its tail looked unusually short. I agreed and snapped another photo. Horrified, I realized the 10:30 p.m. raccoon had lost a third of its tail. This time a fight definitely seemed the most probable cause. Losing a third of its tail would be, of course, a painful injury, but naturalist Jules Evans of Point Reyes Station on Sunday told Dee the loss should not be a permanent problem for the raccoon. Still, I pitied both animals, and poet Alfred, Lord Tennyson’s description of “nature red in tooth and claw” kept coming to mind this week. 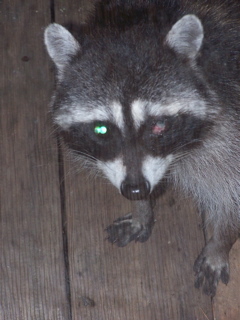 Having two injured raccoons around my cabin naturally made me wonder if they had gotten into a scrap with each other. At 1 a.m. this Thursday, however, both showed up on my deck together. While they growled at each other over crackers a few times, in general they tolerated each other, and neither appeared to fear a serious attack. When it comes to birds, on the other hand, the casualties I see are less likely to result from the “law of the jungle” than the spread of civilization. 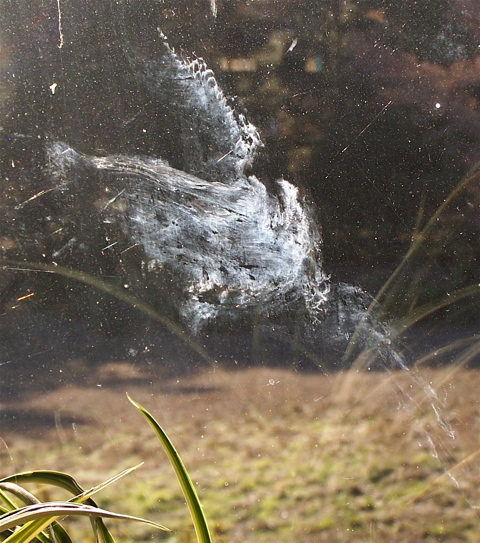 Like most West Marin residents, I periodically flinch upon hearing a bird slam into a windowpane. Luckily at my cabin, birds usually survive their collisions unless they’ve taken off in desperation (e.g. to avoid a pouncing cat). Rather than breaking their necks by flying into the glass head-on, birds generally glance off my windows— perhaps stunned but at least able to fly. Perhaps the oddest case of this I’ve ever seen involved a mourning dove, which glanced off an upstairs window and flew away. What makes this incident particularly odd is that the bird left on the window not only a print of its body, wings, and head, the print included its eyeball and the ring around it. More amazing yet, the image reveals the dark feathers and light feathers on the dove’s upper wing, as well as a bit of its eyeball’s color. So far, I have been unable to find any scientist who can explain the image on my window. The smudge is not mere dust because it could not be hosed off. If any of you know the answer, please send a comment. I’d be fascinated to learn the explanation. I happened to photograph three Brewer’s blackbirds last Sept. 20, the day Venezuelan President Hugo Chavez drew applause at the UN by comparing President Bush’s supposed sulphuric stench to the devil’s and the day after Iranian President Mahmoud Ahmadinejad and President Bush clashed in the General Assembly over Iran’s nuclear program. Chavez’s sarcastic comments were, in fact, mild given that the Bush Administration had taken part in a 2002 coup that tossed Chavez out of office — only to have Venezuela’s poor take to the streets and reinstall him two days later. The widespread applause Chavez and Amadinejad received in the UN General Assembly made this picture seem symbolic: Chavez (at left) eats the lunch of a frustrated President Bush (center) while Ahmadinejad ominously looks on. Now that the Park Service has bought the farm, and rancher Rich Giacomini’s cows no longer give Point Reyes Station its traditional redolence, perhaps it’s time for a new town mascot to replace the Holstein. 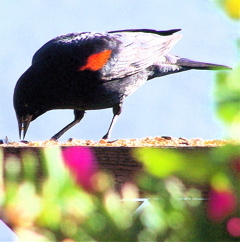 Having often sat on the bench in front of the Bovine while eating a sweet roll, I would vote for the Point Reyes Station’s ubiquitous blackbird. Not only do Brewer’s blackbirds strut about the sidewalk in front of the bakery looking for crumbs, hundreds of them often flock across the street in the Bank of Petaluma’s pine trees, where their chirping creates a din that’s audible a block away. Although set off by several white feathers, the red on a Tricolored blackbird’s wing is far less noticeable than on a Red-winged blackbird’s. Tricolors are often found in the company of Brewer’s and Red-winged blackbirds. 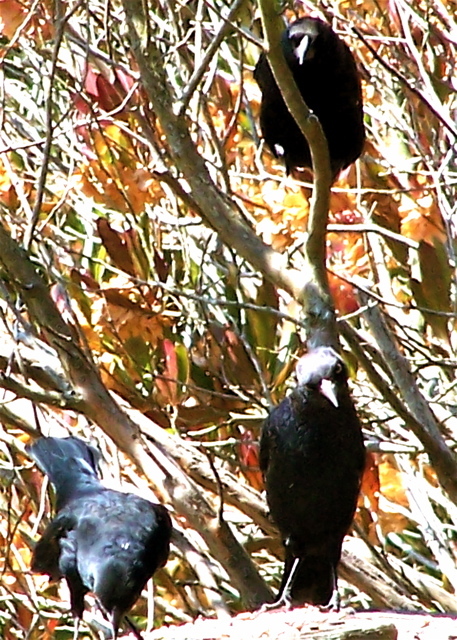 On Point Reyes Station’s main street, the blackbirds’ best show occurs in Spring when they brood in the trees and hedges around the bank and neighboring market. The typical drama consists of Palace Market customers parking their cars and walking through the store’s parking lot, only to suddenly flinch and look around in bewilderment after an unobserved blackbird pecks them on the head as it flies by. 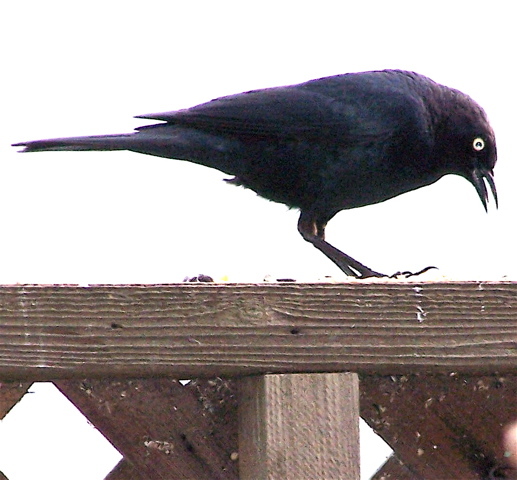 Indeed, Brewer’s blackbirds seem fearless during the brooding season. I once saw a blackbird peck a housecat on the head along Mesa Road behind the bank. When a second blackbird pecked it, the cat ran across the bank’s parking lot and ducked under a car. I was impressed that two birds could have a cat on the run, but the show was just getting underway. There was no stopping one particularly aggressive blackbird that landed under one side of the car, causing — to my amazement — the cat to dash out from under the opposite side. 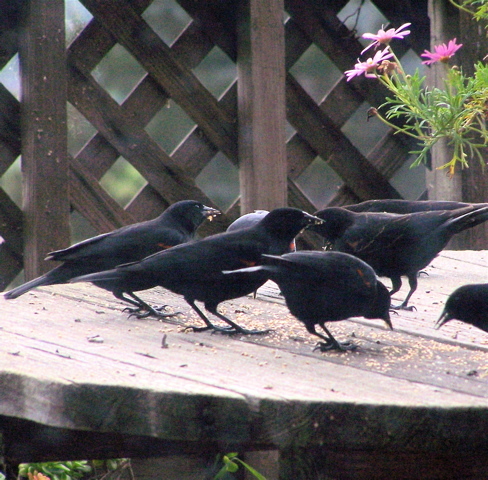 Blackbirds are members of the Icteridae family, and “the big flocks of Icterids in West Marin,” Point Reyes Station ornithologist Rich Stallcup told me this week, “are made up mostly of Red-winged blackbirds — invariably with a sprinkling of Brewer’s and Tricolors. 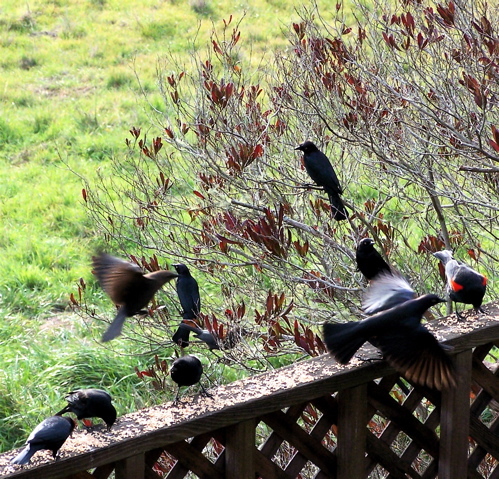 A mix of Brewer’s and Red-winged blackbirds on my railing. 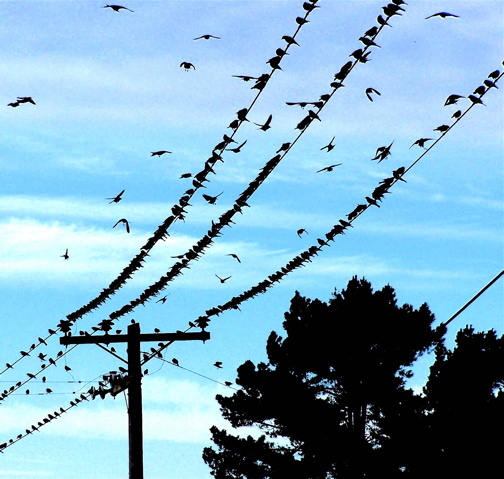 The flocks that gather on powerlines along the levee road around sunset each evening, are Red-winged blackbirds, Point Reyes Station naturalist Jules Evans pointed out Wednesday when we ran into each other at the post office. Blackbirds typically head to their roosting site “from 30 minutes before sunset to 15 minutes after sunset,” researcher Gordon Boudreau of Santa Rita Technology in Menlo Park reported to the Third Vertebrate Pest Conference 40 years ago at the University of Nebraska. Boudreau added that although the bulk of a Red-winged flock has reached the roost site by 15 minutes after sunset, “stragglers continue to arrive for an additional 15 minutes…. All but the late stragglers habitually ‘pre-roost’ on elevated perches nearby for varying lengths of time before moving into the night roosts. Evans added that even small shorebirds continually chatter when in flocks although usually too softly for us to hear. The Brewer’s blackbird (seen here) is named after 19th century ornithologist Thomas Mayo Brewer of Boston. Brewer’s blackbirds (Euphagus cynanocephalus) are protected under the 1918 Migratory Bird Treaty Act, but their survival, Wikipedia notes, is of the “least concern” among protected birds. In fact, most ornithologists don’t consider the Brewer’s blackbird a “migratory species” at all. The birds do, however, move from place to place seeking abundant sources of food, which for them is mostly insects, spiders, and (particularly in Fall and Winter) seeds. “During the day,” Boudreau reported, “wintering blackbirds alternately feed and then loaf, depending on the availability of food. Feeding in open fields is usually [done] in leapfrog fashion, in which all move in one direction, the rear birds rising and landing ahead of [those in front]. Ornithologist Rich Stallcup of Point Reyes Station on Wednesday noted that “at least some of the birds” in this field uphill from my cabin are Tricolored blackbirds.” (At upper right, for example.) Tricolors are nearly “endemic” in California although their worldwide population is small, Stallcup added. 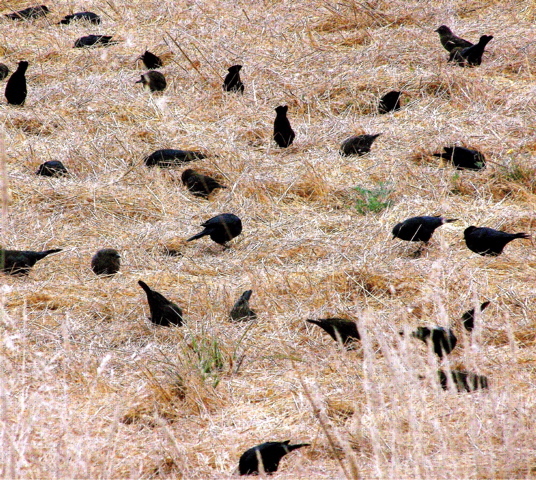 While blackbirds benefit agriculture by eating enormous amounts of caterpillars, beetles, grasshoppers, and other destructive insects, they can also consume large amounts of grain and seed. And when in season, fruit and nuts are also part of their diets. The trick is to tape record the alarm call of each kind of blackbird, which is quite “species specific,” Boudreau reported. These alarm sounds are then “amplified and projected at the birds through loudspeakers. The method is highly effective if the proper sounds are used…. 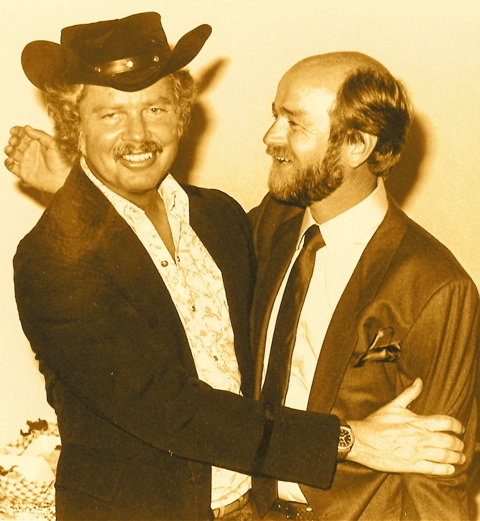 Interesting aside: By 1979, twelve years after Boudreau presented his findings, Lee Martin of BlueBird Enterprises in Fresno told a subsequent University of Nebraska conference that by then biosonic controls were in use internationally to keep gulls away from major airports. 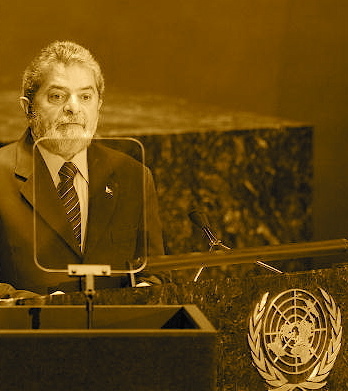 He suggested they also be used to keep migrating birds from resting at industrial-waste ponds where they frequently ingest lethal amounts of waste materials. I’ve yet to hear any biosonic blasts of bird alarms in West Marin, which suggests the local blackbird population isn’t too serious a problem for all the ranches, airports, and industry here. Just for housecats and springtime shoppers at the Palace Market. Sparsely Sage and Timely is powered by	WordPress 4.9.10 and delivered to you in 0.393 seconds using 48 queries.